There is frost on the ground this morning. My teeth chatter and fingers ache as we dive down from the mountains around Olympia. Even with the discomfort, it is hard not to appreciate the beautifully clear skies with a morning sun that promises some warmth. We weave in and out of small rural villages. Elderly women clad in black wander in and out of local stores and old men saunter up and down the roads, often stopping at a bench to rest the legs. Being in the mountains is the best, otherwise the countryside is not particularly interesting nor is it exceptionally pretty. Of course, there are moments when the sun glistens on the thousands of lemon coloured sour sops filling the groves of leafy green olive trees and you find yourself stopping to take a picture. But it doesn't take long before reality kicks back in and you find yourself in a confusion of dumped cars and messy farmlet frontages. But the negative views stop abruptly here, because the people in Greece are just so friendly. We are overwhelmed at their humble nature, politeness and absolute sincerity. It appears to be business as usual on January 1, but the roads are plenty quiet. Apart from the early morning hills, it's flat all the way to Filiatra. A minor road then sends us up and down some short, but very steep gradients. We are close to the coast. Apparently there are two campsites open in Gialova (106km; 653m), 6kms north of Pylos. Only one is. But it doesn't matter because the search for the beachfront pitch is over. We both feel at home immediately in the friendly surroundings and the rather outdated facilities go unnoticed. Especially when there is a perfect sunset over the bay to gaze at. The next morning the campsite manager brings us a handful of sweet mandarins. Citrus fruit is in season and plenty of farmers line roadside with stalls. Six euros gets you 10 kilograms of the best navels you've ever sunk you teeth into: juicy, firm, sweet and full of flavour. A perfect thirst and energy quencher for a hard innings cycling. Today however, we are resting, but as per usual there are first a number of chores to complete. The plan to ride into Pylos is abandoned, due to rain and we decide to spend another day in this jewel of a spot. Out of the blue that evening, we wake to gale force storms and by one o'clock in the morning, Ali is holding the tent in place with all his might. It is immediately concluded that we have to put extra guy ropes out. This proves a very good decision when the rain buckets down and the wind blows with an intensity that we haven't yet experienced. We stay warm and dry in the tent and again, another pat on the back to Helsport. the next, we can't help but marvel at the sturdiness of the whole construction, especially considering only half the lines are out. Can't imagine what sort of force would blow the thing down with all the ropes fastened. Ali heads into town after breakfast, to update the site and do some shopping while I type away and get all the batteries loaded up. By the looks of the weather we'll be blown the entire way into Kalamata. It has been icy cold in the mornings, so we rise a little later today, hoping that the sun will be out when we begin riding. The journey to Kalamata (61km; 611m) looks like a reasonably easy one. An immediate climb is a little challenging, but we are on a minor road where it is perfectly tranquil except for a handful of cars, one truck and the occasional sound of chainsaws trimming olive branches after the picking season. Smoke plumes from small fires burning the discarded wood. Goats, very scared of two cyclists, are herded past us by local farmers and the world looks very picturesque today. That is, until we reach Messini, 5 km from Kalamata. Here an airport, lots of factories, a large gypsy camp with the associated rubbish ruin the earlier beauty. We continue on towards our destination, stopping at a Champion store for supplies and then head out of town along the first touristy beach frontage we have seen on the Peloponnese. Still compared with the south west regions of the Mediterranean coast, everything is pleasantly on a smaller scale here. The campground we are heading for turns out to be defunct and according to a very talkative road worker it has been for at least 2 years. We question the reliability of internet and turn back to a possibility on the outskirts of town. It is well and truly open, quaint but somewhat ramshackle. The facilities haven't seen a cleaner in a very long time, but there is no-one around to collect any money for our stay, so its a pretty good deal. While following Ali through Kalamata, I am hoping that the narrow, potholed road gets a little better. Just like yesterday, we begin to climb as soon as we leave town and it is a continuous up for more than one and a half hours. As we round a bend reaching a 456 metre peak, we sight the hairpin drop ahead which spirals us down to just below 250 metres above sea level. Lunch is necessary by this stage and with energy back in the legs, we embark on the next 3½ hours of hard climbing to reach the 1348 metre pass on the Taygetos mountain range. It is 4 pm when we get to the top and no more than 3° Celsius. Snow has lined the roads for roughly the last 5 kilometres and we have the down gloves and fleecy sweaters ready for the descent. Climbing a mountain always smacks you in the face with an almighty force of nature of some sort. Whether it is the stunning views, the sheer difficulty of reaching the summit or just the conscious realisation of how tiny man is against this amazing grandeur. The drop into the valley below is just as breathtaking. It is a 45 minute, downhill nose-dive and is sadly interrupted buy a couple of stray canines, who suggest they will not let us pass without the use their teeth. I am petrified demonstrating the truth of the saying: "once bitten, twice shy". We stop and while they stop their advances, they continue to threaten by circling us. It is the aggressive bull massive in front of me that is definitely a worry. I manage to slip through and cycle on, but they make a mad dash for Ali and he gets trapped. Conveniently, a passing driver sees what is going on and shields him through the danger so he can catch up with me. The dogs pursue at full speed, but the car remains between us and them. When all seems safe, they speed off to our appreciative thank you waves. We get back to our inspiring pedal through this rock and snow-capped mountain landscape and upon entering the outskirts of Sparti, we sidle up alongside the Taygetos range from where we have just come. It looks so big, I can hardly believe I had actually made it to the top. There you go, anything is achievable. We make it into the outskirts of Sparti (66km; 1552m) in enough time to grab a few things for dinner that night from a local store. Not long after that we are greeted with a beautiful smile and warmest welcome from the campsite owner as we ride into Camping Paleologio Mystras. He even comes to the door before we've got off our bikes. We can camp anywhere and after a short debate over where to set up, we choose a spot close to the amenities block. We are totally alone here. It is very, very cold in the tent and it is very, very warm inside the restaurant bar. It doesn't take too much to to figure out where we spend most of our evening hours. Although we haven't yet experienced cycling into Athens, so far riding a bike in Greece has been sheer pleasure. Especially in comparison to what we came up against in Italy and Spain. The major thoroughfare on the Peloponnese coast is a normal two lane road with extremely wide shoulders. All slow moving traffic uses this part of the road to allow the faster vehicles to pass. What's more, it's all achieved with a gentlemanly demeanor. We are treated like anyone else on the road and while climbing up some of the not so well maintained streets, traffic sits patiently behind us and waits until there is ample room to overtake. We get nods of admiration, beeps and waves, flashing headlights and even a group of young lads on scooters give us the thumbs up of approval. But the nicest gesture yet happens on our way to Sparti. While plodding our way up the mountain, a little red Renault drives past us and then strangely enough whizzes back down again a few minutes later, in the opposite direction. I notice it because I used to have a little car quite similar years ago. About ten minutes later, the same vehicle comes back up the hill, overtakes us and pulls over with a screech and a yank the handbrake. I think: "Oh dear, what now?" But I needn't have been concerned, because the man jumps out babbling excitedly away in Greek, none of which we could understand and hands us a bag of oranges, obviously from his own garden. It is such a touching moment and one that confirms to you that what you are doing is worth every push and every pedal. The instinctive feeling we both had when we stepped of the ferry in Patra is really true. Greece is a rewarding country to cycle in and the people are fantastic. By the way, so are the oranges. The tent is covered with ice this morning and it is really hard work getting the body started. Consequently, it takes us considerably longer than usual to get on the road. When we finally do, we are waved off cheerfully by the campsite owner. It is so cold, I have to dig into my front pannier to pull out the down gloves. It doesn't take long for everything around us including my fingers to thaw out with the morning sunshine. I find the road to Tripoli to be one of those rather irritating climbs. Firstly, it never seems to end and even though it is not at all steep, it proves such hard work. We are a novelty on the road today too and everyone toots and waves in the most friendly fashion. The landscape moves from luscious green to barren limestone rock faces. The sand also turns red in places and I imagine that the Greeks who immigrated to Australia, didn't have much difficulty feeling at home with the countryside there. Australia has a large population of Greeks and Italians and prior to this, I could never quite understand the monstrous stone and marble villas they would build in the middle of suburbia, complete with sculptured lions guarding each side of the wrought iron fence. Travelling through Italy and Greece has definitely put this into perspective for me. We make a fast 5 kilometre dive into a valley of a completely different nature. It is a patchwork of greens and totally flat. Cottage industry stalls line the entire stretch of road into Tripoli (61km; 1007m), but for a change we don't need to stop for supplies. We consider it time for a lavish splurge and plan to sleep in a hotel and eat in a restaurant tonight. We discover that the cheapest double room is 50 euros. It does have an en-suite bathroom though, so we take it. We spend hours in the shower, watch some not very stimulating television, get heat exhaustion from the abnormally high setting on the central heating system and itchy feet, so we venture outside to see what the town has on offer. In a complete circle we pass lounge bar after lounge bar brimming with patrons and ambience a-little-too-chic for our clothing and budget. There are also plenty of very up-to-date fashion boutiques; some not so modern varieties; mouthwatering bread and cake shops; and a couple of news agencies. A traditional ouzo bar with a larger selection of scotch and bourbon also has a few beers from Belgium, which catches Ali eye and we figure, why not?. Tonight is a treat. We relax over a couple, before making our way to the local restaurant next to the massive donut and coffee bar opposite our hotel. American tradition has made its way this far inland. We order several vegetarian meze dishes and are pleasantly surprised by some and a little disappointed by the ones that came out of a tin. Still, it was quite delicious, reasonably priced and our stomachs are completely satisfied. Splashing out on a whim is good for the soul too. Getting "up and down" the elevator and out on the street with all the bags and bikes confirms that we actually like camping better than staying in a hotel room. We are on the road as early as possible even though we only have a short trip to Mykines (69km; 426m). Getting out of town is flat and easy. We start climbing but before too long, we dive the same distance back down again. The views are spectacular over an olive-grove filled valley with train tracks and roads winding through it. Limestone rock faces guide us further as we ascend and bit by bit, we can see the next valley we soon will enter. It is another exhilarating drop and half way down we stop to rest the fingers and enjoy the magnificent view. As we bask delightfully in the sun, munch on cracked pepper, cream cheese and sundried tomato sandwiches, we watch a truck painstakingly lumber up the pass we have just fallen from. After a stop at a Dia Discount Store in Argos, it is plain sailing into Mykines. 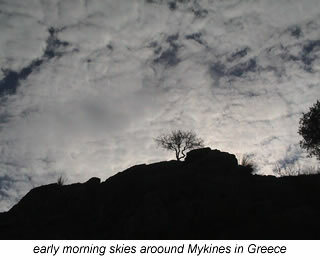 The campsite Mycanae is open all year round. It would have to be the most bizarre, eclectic, but friendliest campsites we have ever stayed in. While the owners treat everyone like a special guest and shower them with fruit and produce gifts from their farm, there is a considerable lack of hot water. The plastic flower arrangements in the eighties erected amenities block highlight the fact that the place could really do with seeing its first renovation. Still, it doesn't stop us from spending 4 nights there. We visit the archeological site, which brags having Europe's oldest monumental sculpture: the Lion Gate. It is pretty impressive just looking at the entrance for what it is, but even more so when you realise that it is around the three and a half thousand years old. The museum is full of wonderful specimens and explanation and it is also mind boggling to see the intricacy of the buttons, combs, jewellery, coins and clay figures from this far back in history. We retreat to the campground that afternoon and discuss our plans for the next couple of days. Ali really wants to go to Stefani, which is up a 857 metre hill. He visited this place for a family wedding in 1973 and returned again in 1974. He is dying to know if the memories that he has are a true picture or not. After a good breakfast - thanks to the delicious bread in Greece - he ventures the 55 kilometres and 1100 alti-meters without me. In total contrast, I sit peacefully by the tent with the laptop, after doing the washing and a few sewing chores. He arrives back earlier than I expect; full of stories of the days events. The telescope his astronomer cousin worked with still exists, though now in poor condition; the rock faces aren't as high as he had imagined; the cobbled roads that only donkeys could tackle are now covered in bitumen; several herding dogs threatened him along the way and an old man who is apparently related to the wife of his cousin invited him in to the local pub for an iced coffee and a chat. We also plan to visit to Nafplio, so on our last day we venture out into a sea of orange groves. I never knew that they grew oranges in such abundance in Greece. And like i said before: they are delicious! We climb the 910 steps to the castle in the town and our calves are still aching 3 days later. All that exercise on a bike and still there are muscles that you don't use. Unbelievable! We leave the campsite with some extra large oranges and a barrage of goodbyes and best wishes from the owners and Gilles, the French artist also travelling by bicycle, but in the other direction. The night before last we looked through his curious and personally perspectived water paintings of his travels so far. Makes me want to do something more as far as my artwork is concerned. Hopefully the time and the head space soon in Istanbul. Back on the road is great and the sun is with us yet again. The trip itself is pleasant, but the rubbish lying in this region is outrageous. It beats me why anyone would want to irreparably foul-up such beautiful countryside. The other little menace is the increasing number of stray dogs. Even the beasts with an owner, can't be trusted. In and around Athens they are lurking in packs at every intersection, abandoned petrol station or car park. After inhaling the not so enjoyable fumes from the oil refineries lining the coast around Sousaki, we arrive at Kineta (64km; 525m) safe and sound and very early for us. It is 2.30pm and we contemplate doing the extra 55km or so into Athens but decide instead to sit here. The winds have become strong enough to put extra guy ropes on the tent and besides Friday afternoon traffic will be picking up soon. After the lack of hot water in Mycanae, I am bitterly disappointed to learn that the ablution blocks here are really badly maintained. The plan to wash my hair will have to wait until Athens. It is rather distressing entering a shower area that is so dirty you don't know where to stand. I hurl a slime covered shampoo container and soap wrapper outside the cubicle. I don't dare go near the hair clogged drain. Two hooks are supplied on a tiled wall that has never seen the right side of a scrubbing brush. The rosette is totally rusted and clogged so water only spurts from eight free holes. This it does quite at random with the tendency of wetting everything inside the shower except you. Still it's better than the cubicle next door in the gents that has no rosette at all. I swear and curse on my return to the tent explaining the terrible state of the amenities which Ali thinks is an over-exaggeration on my behalf. And I admit, I am able to do that quite competently, however, I have to laugh when I see him ever so gingerly step out from the ladies shower area. Obviously the men's was bad enough. We leave a little disgruntled at having to pay 12 euros for basically sod-all. Luckily the campsite owner at Camping Athens is of a completely different character. He is meticulous in keeping the grounds clean and tidy and we find the place a total contrast to guidebook comments about it being "reasonable facilities but nothing else going for it". I can't imagine what more you could ask for from a campground so conveniently situated in a 4 million+ populated city. It is only 7 kilometres or a 50 cent bus ride from the heart; the grounds are the cleanest and house the best amenities we have come across in Greece; it has excellent security and while you can't deter from the fact that it's right on the main road, you will still be able to enjoy sitting amongst the olive trees, palms and other evergreens inhabited by various species of birds and insects. Not a bad spot to camp at all. The cycle into Athens (54km; 441m) reminds me of the ride into Barcelona along winding coastal roads amid industry. The night before we had stormy winds and light rains and today's weather is not much better. There is no telling which way the wind will blow. If it comes from behind, then you can ride like the clappers without using a muscle. In contrast, it's difficult keeping you and your bike on the road when being blown head-on. The Agean Sea is as steel-grey as the clouds in the sky. The darkness is broken occasionally by a few rays of sunshine managing their way through the drab cover. It is cold. As we enter Elefsina, a town a little north-west of Athens, the traffic gets a little busier. We soon find ourselves on a six and sometimes eight lane highway, but a decent shoulder shepherds us most of the way into Athens. Traffic may be congested in parts, but it is not too bad. Trucks divert round us and we literally have the first lane to ourselves. The biggest hiccup of the ride comes as it finishes. Trying to get across the eight lanes of streaming traffic on the main road to Camping Athens is exceptionally difficult. There is an obvious lack of traffic lights and motorists in Greece do not stop for pedestrian crossings. It is Sunday and we have learned that the archeological sites are free to enter, so we venture into the city to visit the Acropolis. Deciding to walk from the bus-stop through town, we end up on a street that leads us through the well talked about junkie and prostitute area. If the grimy sights of a disregarded and broken down suburbia from the bus window aren't enough to depress you, then this will. I can't believe that there are so many down and strung out people congregated in one area - I obviously haven't visited East Hastings in BC Canada yet. I don't feel threatened, just sad. As we make our way towards the tourist area, the surroundings become considerably cleaner. 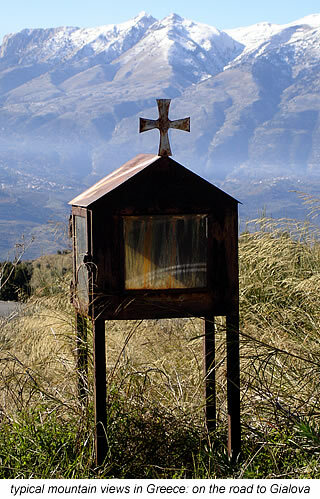 If you only stayed in the city centre, you could leave Athens never knowing what chaos and sorrowful sights await in the outskirts. The Parthenon is a magnificent building, there is no doubt about that and the monumental size is obviously something you can only experience in the flesh, but its structural symmetry is probably better viewed from a history book than as we experience it covered largely in scaffolding and crowded with visitors. We cover a bit of mileage around the town before retreating to the tent in the late afternoon. The next two days that follow are filled with bike and general maintenance chores, website updates and a little bit of translation work. And all this is achieved in our shorts and sandals. At long last, the days are getting warmer and longer and that's just fine by us. A camper's life is so much easier when the sun shines. We stay an extra day in Athens after arriving at the National Archeological Museum early in the afternoon on the fourth day, only to find that it shuts at 3pm. Trusty guide book is once again wrong. It is worth the early rise the next day. What an amazing collection of ancient treasures. My love of sculpture is rekindled. The beauty and craftsmanship of each piece is too incredible for words. You just have to go there yourself. This will be our last long stop until Istanbul which we hope to reach within 3 weeks - 1st week of February. Then we will officially be out of Europe and about to embark on a whole new chapter. Riding out of Athens is one of those horrendously draining rides. We first battle the road out of the city in early morning peak hour, contend with a few mongrels along the way and when we finally find ourselves in a more country-like landscape, the winds begin to blow. And boy, do they blow. I am thrown across the road a couple of times and then almost completely over. I get off and push. It is safer, but I am frustrated that yet again, I am defeated. I'm just not strong enough. But then I see Ali being pushed around as well and I don't feel so inadequate. He also gets off and pushes too and we travel like this, up the highway for numerous kilometres. Our speedometre measures 26% gradients due to the crazy winds and although this is not true we still had an average climb of 4% today with a maximum of 13%. To make matters worse, I have these annoying cramps in my stomach. It doesn't dawn on us until later that it may be the tap water in Athens. That night we ditch what supplies we have and buy some quality mineral water and the cramps have subsided by the next day. We push our way through many a different landscape today and at around 3pm in Aliartos (88km; 1180m), we agree to call it a day. Drained, we take the only hotel room in the town for 45 euros. Before showering, Ali dances around the room a little, as you do when you have a hotel bed after camping for so long. I notice that his body is looking similar to that of a hellenic god and with my renewed passion for sculpture, I almost tell him to hold that pose while I find a lump of clay from somewhere. I'm totally beat though and the moment passes without any action. After a cold dinner, we snuggle into our separate beds for a night of mind-numbing television. The news is that the whole of Europe is under a storm and the what we experienced was not half as bad as in The Netherlands, England or Germany. We count our lucky stars that we weren't travelling there, where winds up to 200km/hour were recorded. A Greek quiz shows keep us amused for a short time while we try and figure out how the game works and what the dickens they are saying. But after such a draining day, it is not long before we are both sound asleep. It is 6.30am; dark and cold outside; warm inside; and I really don't want to get out of bed. Ali neither. But we do anyway. My legs are still shattered from yesterday's ride and it takes its toll on my capability today. I have no push left in me what so ever. Ali thinks I'm putting it on. He even gets off and rather sarcastically, pushes his bike in front of me at one stage. To rub salt into my wounds, I could only just keep up and it is only on gradients of 3% or so. I'm totally deflated and feel like giving this whole thing up. The only consolation is the beautiful weather and stunning countryside. Gives me something else to concentrate on while Ali becomes increasing frustrated with me and I think he is being increasingly unfair. We arrive at the campsite just outside of Delphi (74km; 1117m), early enough to enjoy the warm sun for a few hours and to call a truce over the days events. Directly after dinner, I can't keep my eyes open and lie down for an intended couple of minutes of shut-eye. It is only 8.30pm. My next conscious thought is at 9.30am the following day and I am totally oblivious to what has happened in the in between hours. It is Sunday again and not only do we take advantage of the free tourist attraction scheme, but the glorious 23° Celsius. weather too. We take a wander around the Delphi ruins, which are by far the most beautiful of all that we have seen so far. If you are intending to visit any archeological sites, then this one is a must. I think it is the setting that makes it so special. The museum also attractively displays the sculptural marvels in a spacious and well lit environment. Unlike the overwhelming expansiveness of the Athens Museum, it's well chosen pieces give a great overview of Greek culture and antiquities. We wander back towards to campsite, to find the neighbours leaving. They stop the car, wave furiously and "chow" enthusiastically as they drive away. We never even met them officially and apart from an old sourpuss in the biggest supermarket in Delphi, people really are friendly and extremely sociable. In line with the feel of the weather, we have a spring-clean of our bags and a few kilos are discarded. Night falls with a most spectacular sky and we are soon looking at what must be at least a trillion visible stars. An owl is hooting in a not too distant tree. Ali mimics him. As I walk back from doing the dishes, I can't tell the difference between the bird and the impersonator, until the latter puts his arms around me and hugs me. The rest day was apparently well received because the trip today is relatively easy. Admittedly, it isn't steep and there aren't the winds we have recently experienced. We initially drop 10 kilometres from Delphi into the valley before having to climb back out again for a good couple of hours. It is mountain terrain, with breathtaking views. The going up is very warm, but the going down requires a zipped up jacket with a couple of layers underneath. We are beeped at, saluted and even the police put their siren on for a second or two while waving at us encouragingly. The attention always puts a smile on your face. The 5-6 kilometre drop into Gravia is nothing compared to the 14 kilometre downhill glide into the golden patchwork valley on the outskirts of Lamia. Mind you, we have to ascend out of Gravia for a while before reaping this reward. The roads, up until this point, have been pleasant to cycle on and in really good condition. Unfortunately, the last kilometres of the day are out of the mountains and along a highway full of madness and roadwork. This is where you become completely brain-dead from concentrating so hard at staying on or close to the white line; dodging ripped truck tyres and vehicle debris; fallen witches hats and dead animals and of course the inconveniently placed cat-eyes. Here, the constant drone of trucks braking and then frantically shifting down through their gears as they close in behind you, waiting until there is room to overtake. And of course, there is always the fleeting moment of ambiguity when you hope secretly that they have timed everything right. We pull-off from the unremitting flow and stop for supplies at a supermarket in Stylida. I wander aimlessly up and down the aisles in a total stupor for a number of minutes before realising where I am and what I'm supposed to be doing. The campground is a few kilometres on from the centre of Stylida (107km; 1231m) and the substandard facilities a real disappointment. Our potato and broccoli curry this evening is not. The comfort of the sleeping bags is hard to leave today. It is very cold and the mist has set in around us, meaning our tent remains sopping wet and must be packed up that way. After yesterday, we opt for some country lanes and the trip develops into another climbing adventure. We plan to camp at a site 17 kilometres from Volos, but our plans are ditched, when the road sign distances don't match that of our map. We are using a Road Editions Greece (complete) 1: 500,000 after discovering we would need to buy four 1: 250,000 maps at 8 euros a pop to complete an approximately 10 cycle day tour through to Turkey. It is not the first time that we have found major inaccuracies in this map. Anyway, it is 1.30 pm, we have done 50 km and the 42km we thought we needed to complete, has now become 72km. There's not a hope in the world of reaching that destination, especially when we gaze at the 250m pass in store for us. Thanks to the timely passing of a dark blue Audi, we slip down into Sourpi unharmed and not into the jaws of the three aggressive farmyard dogs. We venture on a bit further into Almyros (76km; 921m) and find a somewhat luxurious hotel for the bargain price of 40 euros. There's room on the balcony to dry the tent and we find ourselves watching the same quiz-show from two days ago. It soon finishes and a desperate last zap of the remote control results in shouts of glee from both of us as we sing along to the Simpson's theme song. We sit back to enjoy an episode we have not yet seen. The owner shakes Ali's hand on departure the next day and waves us goodbye with genuine sincerity from the hotel's back door. There is a service road almost as wide as and running the complete length of the highway. It is a welcomed change and makes for plain sailing. By lunch time, we are both well and truly warmed up and a tailwind adds to the invigorating ride. As we turn it becomes more of a side wind and I then find it incredibly hard to stay on the road. For Ali, it's not as difficult and he once again becomes exasperated at my inability to keep up with him. Although I'm sure it hasn't slipped his attention, I explain that I am a girl and even though I wish it were the contrary, my strength cannot rival his. After fighting my way into Larissa, we turn and the wind is advantageous once more. We pass along unforgotten factories and buildings which lead us straight onto a major highway. There are no signs to say we can't cycle here and no-one seems to mind. No-one comes near us either as the shoulder is mega wide. They don't have to; there are another three lanes for them to use. It ends after 10 kilometres or so at Tembi where we are waved on through a toll point by the same police that whizzed passed us a couple kilometres back. We don't have to pay anything. There is a bit of a climb ahead and the road is narrow with frequent traffic, especially trucks. Everyone is considerably patient, so it is not much of an ordeal. As we head towards the coast, winds pick up and so does our speed. At some stages we reach our record of 40kms/hour on the flat. It is similar to being on one of those fast rides at the showground and just as thrilling. Though thrilling it is not, when the wind changes direction. Like on the downward motion of a roller-coaster ride, laughter turns into screams as you lose all control of your bike. We are only a few kilometres from a supposed tourist resort, but as we enter a ghost town, we know immediately that there won't be anything open here. And we are right. We pass hotel, after guesthouse, after campsite but everything is shut. There is not a soul in sight either. On a more positive point, it is a sad, gloomy and totally uninviting area, so it wouldn't have been much fun anyway. Sadly, though, there is no where to camp wild either. We move on further in search of somewhere to pitch the tent, but still no luck. The desolation makes us feel a little desperate, coupled with the fact that there is a really full-on storm brewing. Cycling against the wind is almost impossible. The sun is well and truly going down as we enter Leptokaria (140km; 779m). We ask several locals before eventually landing on the doorstep of a hotel that is open. This staying in hotels, is getting to be a bit of a habit. It was not at all hard to sleep well last night and we reluctantly crawl out of bed again this morning. I wonder how I will actually pedal anything today. My backside and thighs are still sore from yesterday. The turning point comes when Ali stops at a Kantina - like a pie cart or hamburger stand - and orders two coffees. It is only Nescafe, but it does the trick and we zoom on into Thessaloniki (98km; 367m). Somehow, we miraculously end up on the right street which leads directly to Hotel Akropol. Rooms are okay, facilities not that clean, but it's comfortable; we have a weak internet connection and a plentiful supply of electricity. That'll keep us occupied for a few days. That and going out in search of a decent pizza. It takes us almost two hours, but we eventually find somewhere in the back streets that serves us a mean pizza. A barking dog never bites? Just as my last wound finally disappears from my ankle, a stray doberman - still can't get my head around that concept - in Thessaloniki, lashes out at my calf. Luckily, the bus behind me is a bigger threat to him and he stops midway. And this is not the only dog incident of the day. Along the service road about 50 kilometres into the trip, another canine won't let us pass. We try every passive trick in the book, but it continues to be really aggressive. The worst thing is the owner comes out and even he can't control his pet - if you can call this beast a pet. He starts throwing stones at his own animal, which helps a little, but the dog is still going ballistic and wont let us cycle nor walk away. Much to the owners distaste we resort to stone throwing too, which does get us out of the situation, but I make up my mind, right there and then to purchase a Dog Dazer. And I can't wait to use that Ctrl-Alt-Delete signal on all breeds, all sizes and all ferocities. With recent experience, I can assure you the saying "a barking dog never bites" is a total load of twaddle. Winds are blowing furiously as we leave Thessaloniki. It is icy cold and a few hundred metres up the road, I stop and put the winter gloves on. Ali seems to have little difficulty, but I battle my way against the bluster. Thank goodness we soon take the turn off to greener and quieter pastures. The side wind is now in our favour and we storm past iced puddles and lots of mad barking dogs; mostly chained up which pleases me immensely. A welcomed bus stop in the sun shelters us from the wind while we eat our lunch, but it is so bitterly cold that immediately we have finished eating, we are on the bikes again. There are two very large lakes - Koronia and Volvi - on our left side and in front of some quite spectacular mountains. The alternate (highway) route runs precisely along the bottom. The cold gets the better of us and we stop at a Kantina near Peristeronas for a hot coffee. English is not the owners forte, but with hands and feet and the help of big world map taped to the wall of the pot-belly warmed cabin, we communicate our travel plans. "Krio, krio!" [Cold, cold!] is all the woman can keep saying. "I know, I know!" I nod back to her. Although it's difficult leaving the cosy environment, we hit the road again. Our destination today is uncertain. Entering Asprovolta (91km; 480m), we begin to question as to whether we'll get a warm shower tonight or not. I could really do with one. It's Sunday and one small supermarket is open, but we decide that it's better to try and find a camp spot first. A good 6 kilometres out of town, we approach the seemingly deserted Camping Achilles. It is full of cats sunning themselves and dogs on chains going absolutely berserk at us. They go so bananas, they almost hang themselves on their tethers. No-one appears to be home and we search for a flat spot somewhere in the sun. Ali ventures back into town for supplies and I protect the tent from all the curious hungry cats and a few unleashed dogs. The owner suddenly appears and I'm quickly told it is 12 euros per night. I give her my passport as bond. Shortly after, Ali returns with the bare minimum as the supermarket was closed, but It is enough for today and breakfast tomorrow. The hot shower never eventuates. The heating has been turned off and even though the owner says she has switched it back on and even after a one hour wait, it is a teeth chattering experience that has me making a survival dive into the tent afterwards. We are kept awake all night long, with the incessant dog barking coming from the paddock next to us. Between these strays and the dogs on the campsite, Camping Achilles must have a total of fifteen or so of these not so friendly beasts chained to trees 24-7. The sun might be out, but it is cold again. We leave around nine to a symphony of barking canines. Following the coast line, we are entertained by an overwhelming abundance of bird life as well as the beauty of the sheer drop rock faces that lead our view directly to the aqua Aegean Sea. The roads are in particularly good shape, though busy at times. Apart from the icy winds, it's not a difficult ride into Kavala which is approximately 12 kilometres before our destination. The biggest problem is I want to stop regularly to film and just take in the atmosphere and Ali always wants to keep moving. My pace is slower than his; my choice of image differs from what he would choose to take a snap of; I have a video camera with me and he doesn't. I understand fully, that it might be annoying for him; an under-achievement on the cycling side of things, but I'm not here as a cyclist. I'm a traveller with a bicycle. Many times, I curb my desire to stop and photograph things I see on the way and I'm trying to compensate as best I can but I can't completely ignore what intrigues me most. Reality and the mundane interest me, even if it means catching hold of the darker side of life. That's just me. Ali, on the other hand is the eternal optimist and only likes taking shots that are "picturesque". They say opposites attract. Kavala is a pleasant seaside township with a majestic aqua duct at the top of the hill and plenty of modern facilities. Near Karvali (93km; 556m) on the other hand is the complete opposite: an unpleasant industrial area with an entrance lined in toxic smelling sulphur companies. The township is small and rather ramshackle, as is the campground in the winter. It costs €10 to set up our tent and then we are informed there is no hot water. I ask myself how they have the nerve to ask for any money at all. Somewhat guilty, the owner tries to compensate with two pieces of her town-renowned pizza. Had there not been beef on it, we would have gobbled it up, but sadly it ends up in our rubbish bin. We talk for a long time over the trip in general and Ali is on the verge of giving it up. Surprisingly, I'm more than convinced I want to continue and believe we both have to find a solution to our differences. The debate goes on for a long time and as darkness falls we move the discussion inside the tent. Both fresh in mind and with renewed enthusiasm after the last night's conversations, we depart at our usual time of nine o'clock. Everything goes as per normal, packing up half the bags, eating breakfast and drinking coffee inside the tent, making sandwiches for the road, packing the other half of the bags, pulling down the tent, loading the bikes, cleaning the teeth and filling the water bottles. After a little more than an hour of cycling on the road to Xanthi and as we round a bend at the military camp near Paradisos, we bump into two other cyclists. Simon and Pierre-Yves are heading in the same direction as us. Without discussion, we became a band of four for the next few days. The day passes really quickly and after a highway stint, a long stretch of nature reserve, the town of Porto Lagos and acres of cotton farming country, we find a perfect camping spot, under a bridge near Pagouria (91km; 337m). Despite the cold, we sit outside discussing equipments and exchanging travel stories and till sleep takes over. It is decided that we'll try out some of the minor roads, which take us through farmland and then on to several dirt tracks. We have to stop and ask for directions or at least debate which road to take on a regular basis. I generally stay out of the discussion and use the time to get some filming in. We finally reach bitumen again in Xylagani, where the township men are amused to see four cyclists coming through. A few of them speak German, so Ali has a good ol' chin wag, before goodbyes and well wishes from everyone as we cycle back out. The second leg of the journey weaves us up or down through very green hillsides. The roads are in surprisingly great condition, the sun is shining and it's around 18° Celsius. and that is gloriously absurd for this time of year. Ali and Pierre-Yves debate which way is correct and bring a passing local into the discussion as well. SImon and I wait on the top of the hill for the ultimate decision. They choose the road of rocks, gravel and sand. It is really hard work on the legs but as we but the luscious landscape dappled with white limestone rocks is strikingly different from what we have seen so far. Due to the bumpy ride, Ali's back pannier snaps from its fastening and a quick repair job allows him to continue. Pierre-Yves has been having problems with his back derailleur all day and stops again just before Mesimvria to make some adjustments. Ali and I end up in yet another conversation with a fisherman who speaks German and jus wants to talk about everything and anything. 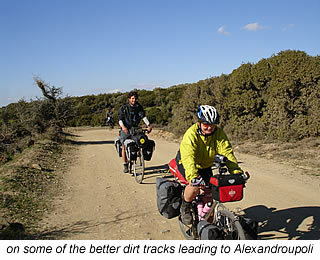 There is still a fair distance to travel if we want to reach Alexandroupoli (68km; 825m) tonight, so we soldier on through some more difficult unpaved terrain. A steep ascend up coastal cliffs and into Dikela follows as soon as we hit bitumen again. The views over the water are stunning, but everyone is pretty zapped from the days climbing on dirt roads to really appreciate it. The first campground we see, we all trundle in. It is reasonably priced and according to the owner has plenty of hot water. That is all we need and we pitch the tents, shower and then make use of the hotel guest's common room and kitchen.The advantages here being: it is undercover, warm, and has comfy armchairs and plenty of company. Beer and red wine flows rather freely that evening, but there is something worth celebrating: it's January 31 and Ali and I been travelling for 6 months. Lucky we have a rest day tomorrow.